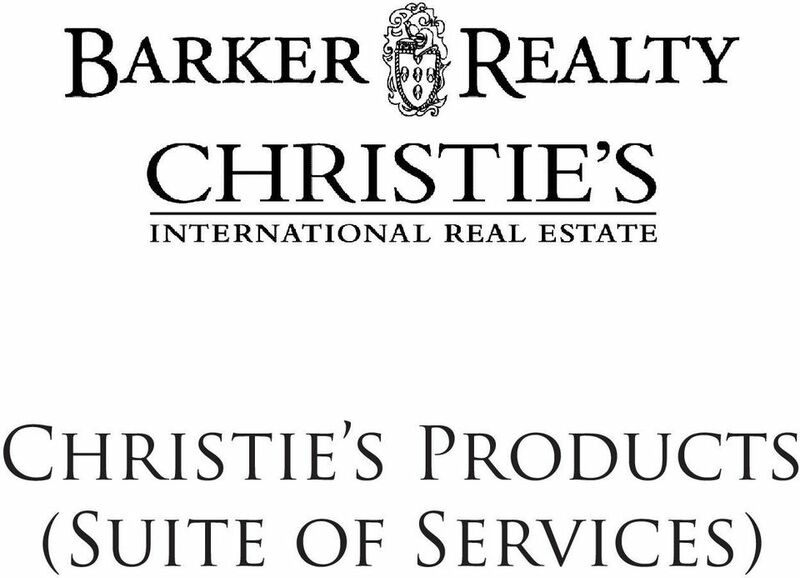 Download "Christie s Products (Suite of Services)"
2 Christie s Products (Suite of Services) Listing Tools Complimentary Luxury E-brochure - An effective way to market listings to your peers in the association. 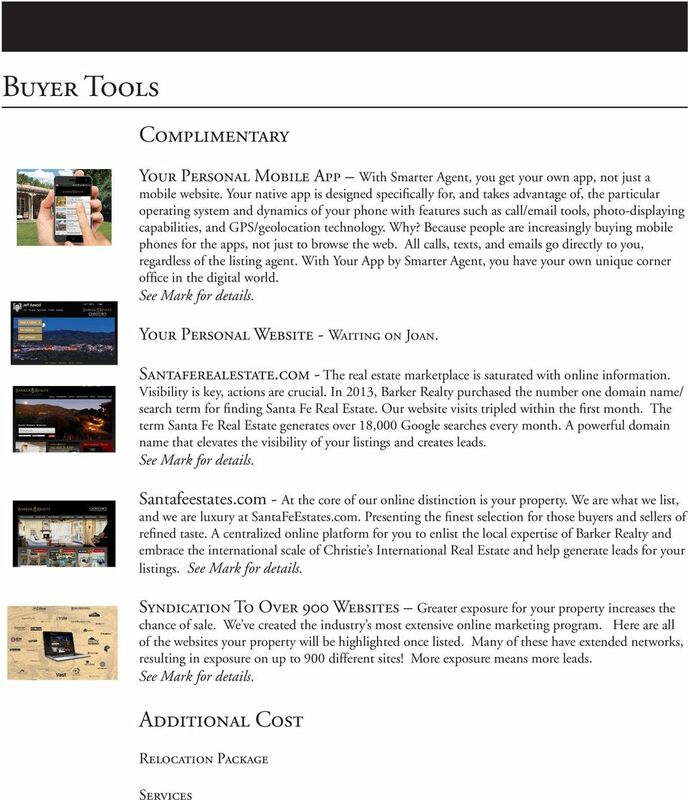 These interactive s are co-branded with Barker Realty & CIRE and are great listing presentations tools to demonstrate the quality of your marketing. Real Estate Guide Listings and sales are promoted in the Santa Fe Real Estate Bible to show sellers, potential sellers and buyers that you have Luxury market exposure, listings and expertise. Christiesrealestate.com Your picture and bio are listed on CIRE s website promoting you to sellers and buyers from around the world. You re listings are promoted on the website, giving you digital global exposure and creating lead opportunities. 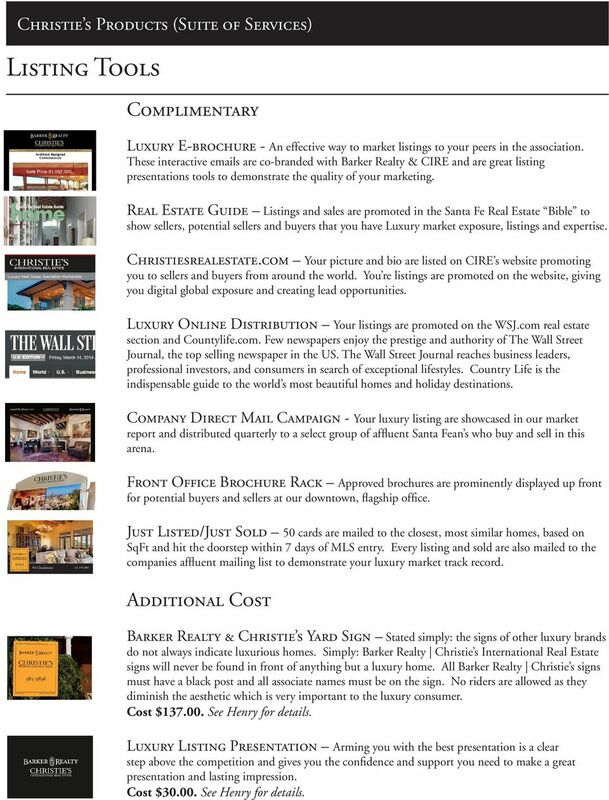 Luxury Online Distribution Your listings are promoted on the WSJ.com real estate section and Countylife.com. Few newspapers enjoy the prestige and authority of The Wall Street Journal, the top selling newspaper in the US. The Wall Street Journal reaches business leaders, professional investors, and consumers in search of exceptional lifestyles. Country Life is the indispensable guide to the world s most beautiful homes and holiday destinations. Company Direct Mail Campaign - Your luxury listing are showcased in our market report and distributed quarterly to a select group of affluent Santa Fean s who buy and sell in this arena. Front Office Brochure Rack Approved brochures are prominently displayed up front for potential buyers and sellers at our downtown, flagship office. Just Listed/Just Sold 50 cards are mailed to the closest, most similar homes, based on SqFt and hit the doorstep within 7 days of MLS entry. Every listing and sold are also mailed to the companies affluent mailing list to demonstrate your luxury market track record. Additional Cost Barker Realty & Christie s Yard Sign Stated simply: the signs of other luxury brands do not always indicate luxurious homes. 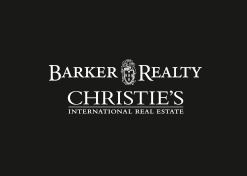 Simply: Barker Realty Christie s International Real Estate signs will never be found in front of anything but a luxury home. 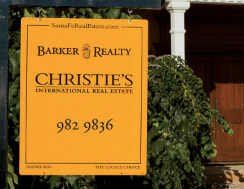 All Barker Realty Christie s signs must have a black post and all associate names must be on the sign. No riders are allowed as they diminish the aesthetic which is very important to the luxury consumer. Cost $ See Henry for details. Luxury Listing Presentation Arming you with the best presentation is a clear step above the competition and gives you the confidence and support you need to make a great presentation and lasting impression. Cost $ See Henry for details. 3 Leather Presentation Box - Designed with a sleek, refined aesthetic and made from premium black nappa leather, the Christie s International Real Estate leather presentation will set you apart from your competition at important listing presentations. Cost $ See Robert for details. Christie s Signature Program - Marketing program designed especially for homes offered for less than $5 million. Provides a new customized marketing service to help agents list and sell homes below $5 million under the Christie s International Real Estate brand. Cost: 10% of listing commission due upon sale. See Warren or Tommy for details. Christie s Bespoke Program Reserved for extraordinary properties priced in the top 10% of the your market, the program offers exclusive marketing channels for promoting your property to the world. Cost: 25% of listing commission due upon sale. See Warren or Tommy for details. CIRE Brochure Program - Investors in fine art and collectibles are an important audience of potential homebuyers. Visually rich property brochures are available to Christie s art patrons at 10 salerooms and 53 offices in 32 countries, including the new luxury markets in Hong Kong, Dubai, Mumbai, and Moscow. In addition, brochures may be mailed to a select list of affluent individuals, both in your local market and to appropriate demographics. Cost: 2-Page Brochure Print Only $1,850/Print & Digital $2,150. Other options available, contact Warren or Tommy. 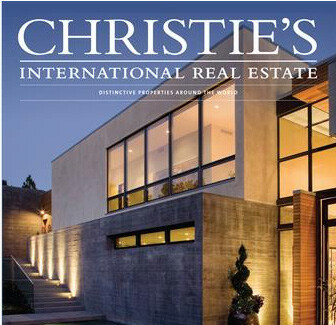 Christie s International Real Estate Magazine - The Christie s International Real Estate network, dedicated to the marketing and sale of luxury residential real estate worldwide, achieves sales in excess of $125 billion annually. Christie s clients 8,000 copies. The magazine will be mailed to select Christie s clients and will be available at more than 450 Christie s auctions annually. Affiliate network 30,000 copies. The magazine is distributed by the Christie s International Real Estate network of Affiliates, which consists of more than 900 real estate offices in over 40 countries. Cost: $3, per page. See Tommy for details. Real Estate Guide Advertising - Offers more than 60,000 readers information and advice directly related to market trends and home ownership essentials. HOME advertisers enjoy maximum exposure from the publication s full-month shelf life with full distribution the first Sunday of every month in the Santa Fe New Mexican additional 3,000 copies are distributed free in newsstands throughout Santa Fe. Cost $1, per page. See Tommy for details. Other Publications Christie s offers a number of national and international advertising opportunities. Ask Tommy for a copy of the 2014 Affiliate Advertising Kit. For local opportunities ask Tommy. He s happy to help you tailor a marketing plan for any new listing. Luxury Brochures All Christie s listings require a Luxury brochure. It s an 11 x 17 brochure printed out of house on cover high gloss stock and makes a real statement to sellers and as an example on listing presentations. Cost is $3.00 per piece with a minimum of 25. See Henry for details and other options. 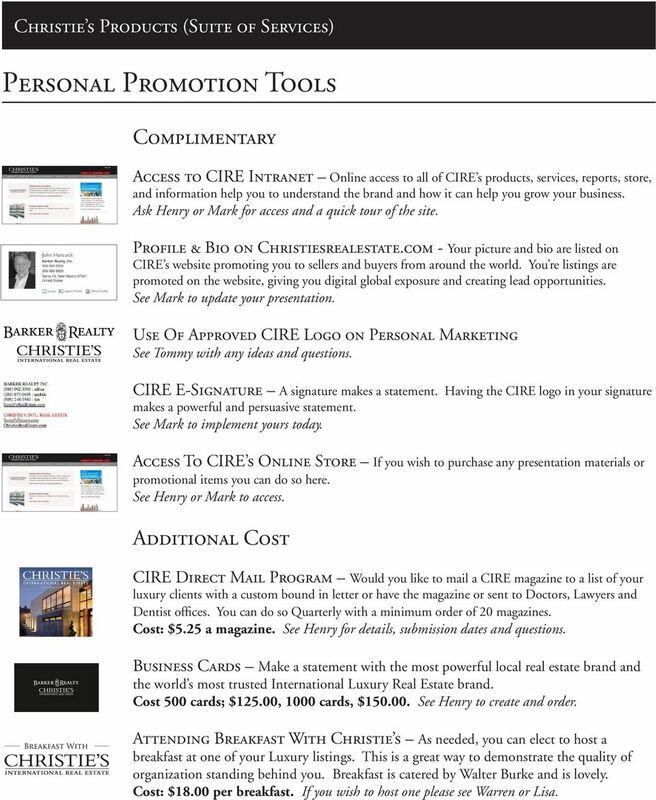 4 Christie s Products (Suite of Services) Personal Promotion Tools Complimentary Access to CIRE Intranet Online access to all of CIRE s products, services, reports, store, and information help you to understand the brand and how it can help you grow your business. Ask Henry or Mark for access and a quick tour of the site. Profile & Bio on Christiesrealestate.com - Your picture and bio are listed on CIRE s website promoting you to sellers and buyers from around the world. You re listings are promoted on the website, giving you digital global exposure and creating lead opportunities. See Mark to update your presentation. Use Of Approved CIRE Logo on Personal Marketing See Tommy with any ideas and questions. CIRE E-Signature A signature makes a statement. Having the CIRE logo in your signature makes a powerful and persuasive statement. See Mark to implement yours today. Access To CIRE s Online Store If you wish to purchase any presentation materials or promotional items you can do so here. See Henry or Mark to access. 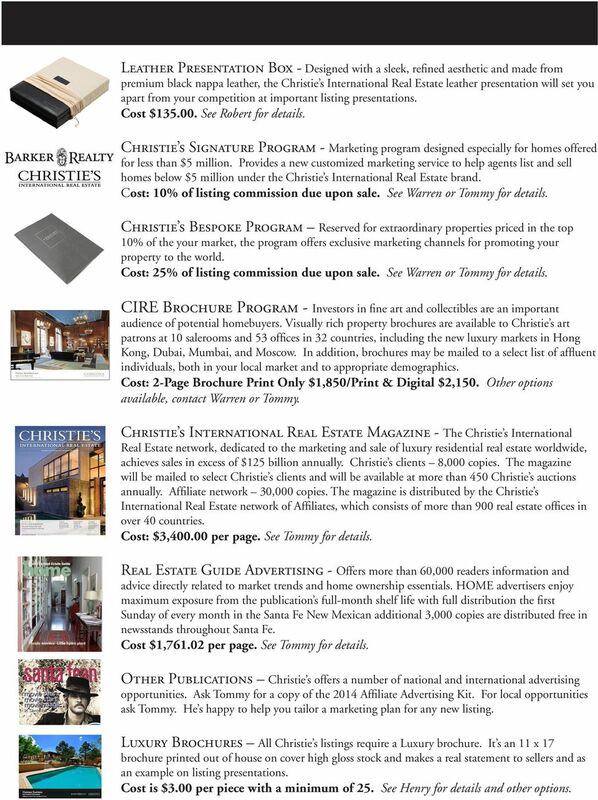 Additional Cost CIRE Direct Mail Program Would you like to mail a CIRE magazine to a list of your luxury clients with a custom bound in letter or have the magazine or sent to Doctors, Lawyers and Dentist offices. You can do so Quarterly with a minimum order of 20 magazines. Cost: $5.25 a magazine. See Henry for details, submission dates and questions. Business Cards Make a statement with the most powerful local real estate brand and the world s most trusted International Luxury Real Estate brand. Cost 500 cards; $125.00, 1000 cards, $ See Henry to create and order. Attending Breakfast With Christie s As needed, you can elect to host a breakfast at one of your Luxury listings. This is a great way to demonstrate the quality of organization standing behind you. Breakfast is catered by Walter Burke and is lovely. Cost: $18.00 per breakfast. If you wish to host one please see Warren or Lisa. 300+ 35+ How to Sell in New York City. Our Knowledge WHY USE AN AGENT? Agents. Years in Business WHY STRIBLING? If you have products or services targeted at the 50+customers, you have to be at. Visit us at www.50plusindia.com. 2015 Life is for living! The Marketing Plan. The business must make decisions on how to apply its resources to the target market(s). MARKETING KUNG FU: 25 Things. Every Marketing Department Needs. Use this checklist as a guide or as a starting point for your complete marketing plan. MARKETING KUNG FU: 25 Things Every Marketing Department Needs Use this checklist as a guide or as a starting point for your complete marketing plan. 1 Your Business Plan How big is your market opportunity? Mark your calendar and save the date the Treasure Coast Real Estate Expo is Sunday, June 9 th from 11 a.m. to 5 a.m.
Reach the most qualified travel buyers in the world Are you ready to increase yield and revenue? Sabre Merchandising Solutions helps you carry out measurable, targeted and creative marketing campaigns.